After Biodesign students explored Yosemite, Grand Canyon and the Mendocino coast, it was not uncommon for them to vow publicly (or privately) to return to one of the areas when they became adults. I have no record of how many achieved that goal, but I do know of one ex-student who has climbed Half Dome 8 times. Therefore, I was not surprised when an ex-Biodesigner mentioned that he was joining a group that was going to retrace the hike that his class took over 20 years earlier. After allowing time to absorb the sublime beauty, the group headed south, 1.4 miles to Illilouette Fall. Turning left at the waterfall, they ascended the Panorama Trail to Panorama Ridge. After approximately 2 miles the trail descended steeply downhill and joined the John Muir Trail, which originates in Yosemite Valley. A short walk to the top of Nevada Fall provided a great place to remove backpacks, relax and eat lunch. After a leisurely lunch, the students donned their backpacks and trudged 1.8 miles to their first trail campsite in Little Yosemite Valley. 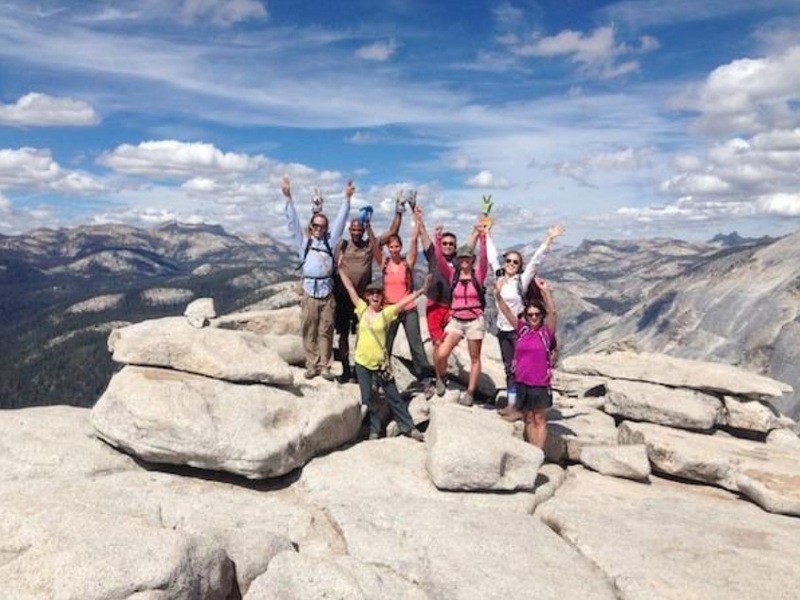 The next morning, after breakfast and a briefing of the day’s activities, backpacks were hoisted and they began the challenging, 4-mile-hike up 2700 ft. to the top of the 8800 ft. Half Dome. 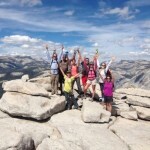 After sleeping on Half Dome, the group made the 10-mile descent back to their basecamp at Yosemite Valley. After the ex-student returned, I contacted him with a request to hear about his adventure. He gladly obliged and filled me with wonderful stories and images. His group left their backpacks at Little Yosemite Valley and they hiked up Half Dome in time for a gorgeous sunset. However, when I casually asked him how they handled the trail meals, he looked a bit sheepish and said, “Our guides took care of all of that.” I was not aware of such services, but quickly connected the dots and blurted out, “I HATE YOU!” Of course he knew that I was kidding and we shared a hearty laugh. He obviously had not forgotten that a major chore for the Biodesign trips to Yosemite was preparing trail meals for a group of 30. Rather than packing 15 small backpack stoves, we took three MSR Rapidfire stoves. Each one sounded like a small jet airplane, but could get six quarts of water boiling in about 10 mins. We carried 3, 6-qt. pots and each pot provided enough hot water for 10 hikers. John Muir hiked mostly alone at Yosemite and was happy with a single wool blanket and pillowcase with some dried bread balls and some tea. However, I truly believe that he would both approve and marvel at the evolution of the latest backpacking equipment and trail techniques, including professional guides. After all, he himself guided many Yosemite visitors, including President Teddy Roosevelt. Roosevelt was so impressed with Muir’s wilderness that, after returning to Washington D.C., he ordered 230 million acres to be protected and formed the foundation for the US National Park Service and the US Forest Service. Sherpas in Yosemite? Why not? easily, you need some initial traffic only. How to get it?